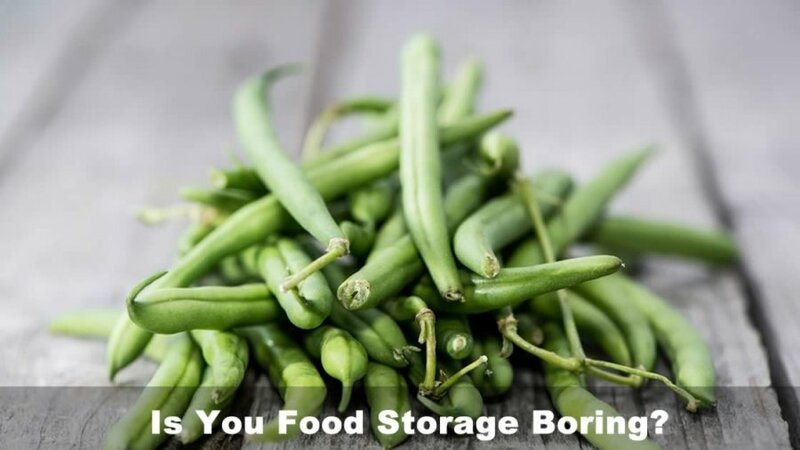 Preppers – Is Your Food Storage Boring? It seems that every prepper, regardless of their reason for prepping, sooner or later focuses on food. I have seen many takes on food storage. One thing that I have noticed is the overwhelming focus on the basics, which makes for some pretty boring meals. A person will have large quantities of beans and rice, perhaps a few gallons of water, and some canned staples. Somehow austerity seems to be clung to with a sense of pride. It’s as if there is something noble about surviving on bland beans and rice for 20 years. Others will go out and spend several hundred dollars on a set of cast iron cookware that would make any pioneer woman jealous, just to leave it in the boxes on the shelf to rust. Can Preppers Survive on Beans and Rice Alone? Look around. If the previous statement applies to you, then I have a challenge for you. Get out some pinto beans, light a fire in your back yard, boil them up in your unused cast iron pot and eat nothing else for the next week. Let me know how that works out for you. I’m pretty sure you won’t be needed those dr oz recommended diet pills, ha, that was a joke. I contend that you will not want to see another pinto bean for the next year. You will survive. You will lose weight. And, you will suffer from “food fatigue.” You will quickly learn to dread the sight and smell of pinto beans. So, what is the point of this challenge? Too many of us equate “survival” with austerity and suffering. I believe that just because they call it survival, it doesn’t mean you have to suffer. A bit of knowledge, some simple supplies, and a heap of practice are all you need to learn how to make your food storage not just edible, but delectable as well. Do You Burn Your S’mores? Many of us have rarely if ever cooked over an open fire. Somehow we expect that it will come naturally to us, sort of a birthright if you will. I had treated her like the goddess that she is and served her a burnt offering. Needless to say, we went into town and ate at Denny’s. What Is the Point of All This Rambling? My wonderful wife and I have cooked many excellent meals over open fires in the 30 years or so since that meal fit for the gods. I will be writing a column for Survivalist 101 called “The Open Fire Chef.” The intent is to pass on the many things I have learned over the years cooking over an open fire. The goal is to inspire our fellow preppers to practice. Inspire them to learn how not just to have a pale drab green existence, but to enjoy a colorful life regardless of what is going on around us. This will not be just another cooking article with a recipe and a tasty picture. There will be lessons on building fire, fire pits and grills. You will learn how to manage your fire and adjust the heat, as well as what kinds of fuel to use for your fire. Discover the proper rigging for pots and how to cook almost any dish over a fire. Learn how to construct a kitchen in the woods and collect recipes galore. Not only will you read about these recipes, but there will be videos to go with them. I also want to encourage input. If you want me to cook something then send me a message in the comments and I will do my best to demonstrate how it is done over an open fire. I will be posting the videos on my You Tube channel Keeper of the Mountain. Previous: 9 Easy Steps on How to Start Homesteading Today!